tags: This December, a generation's final journey begins. After a joyous wedding between William Riker and Deanna Troi, Captain Picard and the Enterprise crew stumble upon a positronic signature which results in a prototype version of the android Data. Then the Enterprise is invited to Romulus to negotiate a peace treaty with the Romulans by their new leader, Praetor Shinzon. However, Shinzon is revealed to be a clone of Picard who was raised on Remus, a slave planet to the Romulans. Later on, Picard discovers that this peace treaty was nothing more than a set-up on account of the fact that Shinzon needs Picard in order to survive. But little do the Enterprise crew know that Shinzon also plans to do away with the Federation by unleashing a weapon that could destroy a whole planet. On their way to William Riker and Deanna Troi's honeymoon on Betazed, the Enterprise heads near the Romulan Neutral Zone, and picks up a prototype version of the android Data. Immediately, they are diverted to Romulus, where the new ruler, Praetor Shinzon, a human cloned from Captain Picard who lives on the slave planet Remus, appears to want peace with the Federation. But then the crew detects a break-in on their computer systems, and Picard is captured by the Remans because Shinzon needs him as his only matching supplier of genetic material. Picard and the Enterprise crew escape, only to find themselves battling Shinzon's completely cloaked Warbird, who goes after the complete destruction of Earth. I may not be a total trekkie, but i still enjoy the next generation crew. this star trek movie was really good, but didn't have as much action as the others, i was surprised, but it was probably cuz their all getting older. i still love all the characters, espeically Brent Spiner as Data, cuz i always thought he was different and cool, but where was wil wheaton's character in this movie, and the guy who played Q? they should have been in this movie. all in all, the old characters with the new characters worked well for the movie. the only i hated about this movie was at the end when data sacrificed himself to save picard. i demand a re-write! 8.4 out of 10. First Contact was the definitive TNG motion picture, Insurrection was disappointing, so Nemesis had a lot to live up to. All in all the film flowed well and all the usual Star Trek iconography was present, along with some updated tricorders and a new Land Rover style buggy. I saw the film with 6 other people, 4 fellow trekkies 2 non-trekkies, and all enjoyed it, however as a trekkie you will be pointing out the mistakes throughout. I wont spoil what they are, but you will notice! Just sit back and enjoy a well put together standard Trek film, which will entertain you and keep you busy for a couple of hours. DEEP SPACE NINE FILM NEXT PLEASE!!! There comes a time when the future looks old, and that's where "Star Trek" finds itself on the time-space continuum. 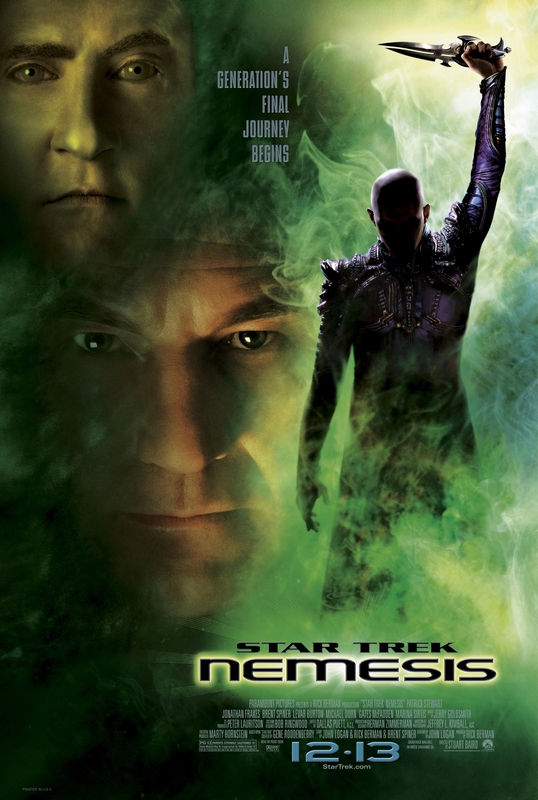 When Reman Praetor Shinzon (Tom Hardy), the new ruler of Romulus, invites the Federation to negotiate peace, Captain Jean-Luc Picard (Patrick Stewart) and the Enterprise are sent to act as emissary. Picard is shocked to find that Shinzon is human, unlike the other Remans, and that he was actually cloned from Picard's own genetic material. It soon becomes apparent that Shinzon does not want peace but is plotting the destruction of Earth. The Enterprise, alone in the neutral zone, must try to stop him. All of the Enterprise-D crew are back: Captain Jean-Luc Picard, Commander Will Ryker (Jonathan Frakes), Lieutenant Commander Data (Brent Spiner), Lieutenant Commander Geordi LaForge (LeVar Burton), Lieutenant Commander Worf (Michael Dorn), Dr Beverly Crusher (Gates McFadden), counselor Deanna Troi (Marina Sirtis), bartender Guinan (Whoopi Goldberg), and Majel Barrett as the voice of the Enterprise computer. In addition, Wesley Crusher (Wil Wheaton) can be seen seated at the end of the wedding table at the beginning of the movie, and Admiral Kathryn Janeway (Kate Mulgrew) from the TV series Star Trek: Voyager (1995) (1995-2001) is seen on an incoming transmission from Starfleet Command. A nemesis an enemy or an opponent that seems unbeatable. More specifically, it is an archenemy with whom the protagonist (often) has a long-standing rivalry for very personal reasons. In the context of the movie, Shinzon appears to be Picard's nemesis, due to Shinzon's frustration of feeling like an inferior version of Picard. It takes place in 2379 A.D., four years after the events in Insurrection. The Remans are the native inhabitants of the planet Remus, the sister planet of Romulus. Romulus and Remus were named as such by the Romulans, who were originally a group of Vulcans who had left Vulcan two millennia earlier, before the Vulcans became an enlightened species who embraced logic. The Romulans have therefore retained much of their former brutality. When settling on Romulus, they also annexed the neighbouring planet, dubbed it Remus, and subdued the native people, who were henceforth called 'Remans'. The Remans are virtually slaves, performing forced industrial labour on Remus and serving as expendable soldiers in the military without the possibility to rise up to command or political functions. Being a completely different race explains the vastly different appearance of Remans compared to the Romulans. The Remans have only ever inhabited the dark-sided hemisphere of Remus, causing their pale appearance and sensitivity to light. With no warp drive, no photon torpedoes left, and the Romulan warbird "dead in the water", it is up to the Enterprise to defend herself against the Scimitar. Shinzon positions the Scimitar directly in front of the Enterprise, and, knowing they have no weapons left, suggests they surrender. Picard suddenly rams the Enterprise into the Scimitar, seriously damaging and disabling both ships, but not the Scimitar's thalaron weapon. With no other option, Picard tries to initiate the self-destruct sequence but finds that it's offline due to the damage. As the Scimitar backs itself away from the Enterprise, Shinzon orders the deployment of the thalaron weapon, intending to kill everyone on the Enterprise. When Picard realizes Shinzon's intent, he places Data in command and beams over to the Scimitar, after which the transporter blows up. Realizing that Picard now has no way to get off the Scimitar, Data leaps across the airless void between the two ships and sets out to find Picard, who is already engaged in hand-to-hand combat with Shinzon. With two minutes left until the thalaron firing sequence begins, Picard lures Shinzon into a lunging attack and kills him by impaling him onto a metal support rod. With less than 30 seconds left until the thalaron weapon fires, Data locates Picard and plants his single-use personal transporter on Picard. The Captain safely beams back to the Enterprise, while Data blows up the thalaron device, taking both the Scimitar and Data with it. Romulan commander dispatches rescue ships and invites the Federation to resume peace talks. Picard and the senior staff retire to the Captain's room, where they have a tearful salute in Data's honor, and reminisce about their adventures with him. In the final scene, as the Enterprise undergoes repair in space dock, Picard says goodbye to Captain Riker who is preparing to leave the Enterprise in order to take command of the USS Titan and begin peace talk with the Romulans. Picard then meets with B-4 to tell him about his "brother" and how Data's curiosity led him to strive to improve himself. B-4 doesn't quite understand but, he is seen trying to sing "Blue Skies". Yes. A novelization of the movie by American science fiction writer J.M. Dillard (pen name for Jeanne Kalogridis), was released in 2002. So far, there are 13. Star Trek: Nemesis was preceded by Star Trek: The Motion Picture (1979) (1979), Star Trek: The Wrath of Khan (1982) (1982), Star Trek III: The Search for Spock (1984) (1984), Star Trek IV: The Voyage Home (1986) (1986), Star Trek V: The Final Frontier (1989) (1989), Star Trek VI: The Undiscovered Country (1991) (1991), Star Trek: Generations (1994) (1994), Star Trek: First Contact (1996) (1996), and Star Trek: Insurrection (1998) (1998). It was followed by Star Trek (2009) (2009), Star Trek: Into Darkness (2013) (2013) and Star Trek: Beyond (2016) (2016). Star Trek: Nemesis is set after Star Trek: Voyager. After Voyager finally returned home to Earth, Captain Kathryn Janeway was promoted to Admiral and she gave Captain Picard the assignment of going to Romulus and meet with Shinzon.